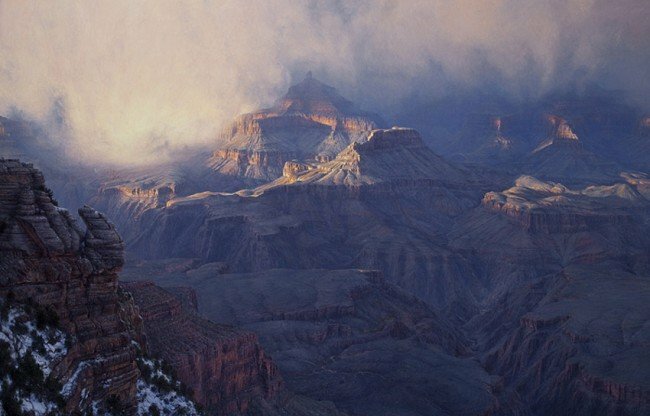 Local artist Curt Walters has continued living up to his immaculate reputation as a True Master painter with yet another award from one of Western Art’s top two shows. At this year’s Masters of the American West exhibit at the Autry National Center in Los Angeles, the artist received the Trustees’ Purchase Award, given in recognition of artwork designated for purchase by the museum. This places Walters side by side with other great American artists such as Albert Bierstadt, Thomas Moran and Thomas Hill, as well as contemporary greats such as Howard Terpning, Clyde Aspevig and Bob Kuhn. The winning piece was the voluminous “Splendid Turmoil,” a 54” x 84” oil on canvas painting of Walters’ signature subject, the Grand Canyon. The winning panorama has now become part of the museum’s permanent collection. In 1999, at his first showing with Masters of the American West, Walters was delighted to win the David P. Usher Patrons’ Choice Award. He is also a six-time winner at the National Cowboy & Western Heritage Museum in Oklahoma City, including the highly coveted Prix de West Purchase Award and the only artist to twice earn the Frederic Remington Painting Award. He has claimed another three wins at the Eiteljorg Museum’s Quest for the West show in Indianapolis, and a Patrons’ Choice Award from Denver’s Artists of America — all in the past decade. To view the Awards and Honors Curt has recieved over the years, please view his Picasa Photo Albums here.